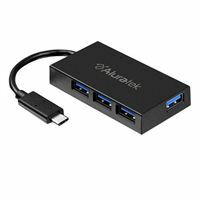 Alurateks 4-Port USB 3.1 Gen 1 SuperSpeed Type-C Hub provides the easiest way to expand your connectivity for your desktop or laptop. With the ever-increasing number of USB devices such as MP3 players, printers, scanners, and external hard drives, you always need more USB ports for your computer. With Hi-Speed USB 3.1 Gen 1 at transfer rate of up to 5Gbps, you will able to transfer or backup your MP3s, digital photos and digital videos in no time. The Type-C hub is a convenient and efficient tool designed to connect to your MacBook, Chromebook or other devices that support the USB-C port and connector. Furthermore, the adapter can easily tuck into your pocket or notebook bag for easy storage and transport. The adapter is backward compatible with USB 3.0 and USB 2.0 specifications and USB bus-powered which requires no external power adapter.